Since its inception, The National Interest, the leading realist journal of international affairs, has devoted a good deal of attention to the relationship between Moscow and Washington, from the dying days of the Cold War to the prospect of true Russian-American partnership following 9/11. This work brings together the reflections and ruminations of statesmen, policymakers, and academics on developments and forecasts about one of the world's leading geo political actors. 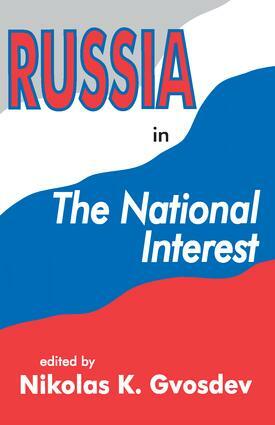 This edited volume is the third in a series of readers co-produced by The National Interest and Transaction Publishers. Each brings together in one place prescient analysis and provocative assessments, this case, about Russia, published in the last decade. For some of the contributors, Russia is to be viewed with suspicion, a state whose current weakness has only retarded, not extinguished, its hegemonic ambitions to dominate Eurasia. For others, Russia is a strategic partner and prospective ally. This volume tackles the hard questions. Readers have the opportunity to listen in on a number of the great debates surrounding Russia policy. Is Russia finished as a great power, or will its influence grow in the coming years? Can a true partnership be forged between Washington and Moscow based on common interests and values? To what extent can Russia be integrated into the institutions of the Euro-Atlantic community? Has American policy aided or harmed the course of market reforms and democratization over the past decade? Is the -war on terrorism- a sufficient foundation for a new U.S.-Russia relationship? How can conflicting interests, whether in Iran, Iraq, or North Korea, be dealt with? This book presents a fascinating and multifaceted look at a country that is likely to remain a major factor in U.S. foreign policy in the twenty-first century. The list of distinguished contributors to this volume includes Zbigniew Brzezinski, William Odom, Stephen Sestanovich, Robert Legvold, Martin Malia, Alexey Pushkov, and Dimitri K. Simes.